How to convert a video to mp4? 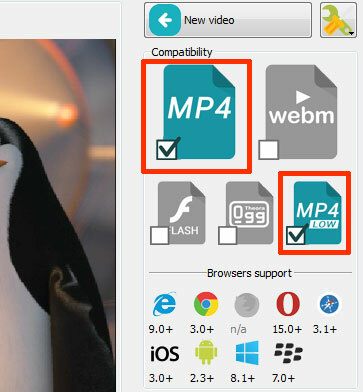 What is the MP4 Video Format? If you've spent even a few weeks using computers, then you've probably run into many MP3 music files. Well there are a lot more formats out there including the very popular MP4 or MPEG-4. You might assume that it's just an upgrade to the mp3 file type but actually MP4 is a container based on the QuickTime File type which supports the combination of video, audio, and still images usually to produce videos in a movie making utility. MP4 files are essentially an evolving standard based upon the original MPEG-1 and MPEG-2 video formats. It includes many of the same features including support for 3d rendering and object oriented composite files. Compared to other MPEG format, MP4 or MPEG-4 is significantly better at compressing video files for smaller file sizes. Mp4 video files are one of the most commonly accepted and best compressed formats online. Using software like Open Broadcaster Software you can actually record windows of your screen straight to mp4 format. When it comes to uploading your videos to websites like YouTube or Vimeo, mp4 files are supported and will have a faster upload time due to smaller compression than other formats like AVI files. An unedited .flv file may be even smaller but the problem is that major video editors like Adobe Premier often do not support the editing of the .flv extension. In addition to YouTube, most desktop media players will support the mp4 format but not necessarily out of the box. You can install codecs so that your players know how to read it properly. One of the best codec packs for resolving most of your playback issues of any video and audio formats is the CCCP which is available here. It's worth noting that iTunes supports it right out of the box with no extra codecs necessary. One of the most common tasks with any video files is to convert them from one format to another. You might need a smaller file size to stick on a thumb-drive or want to have it in a format supported by your editor. If you need to convert one of your videos to MP4 or HTML5 then you may considered checking out convert it for you.